This is a refreshing pudding and easy to make. The mandarin peel makes the pudding quite fragrance. Pumpkin skin is quite tough to peel. I cooked the pumpkin with the skin on, once cooked the skin will become very soft. For this recipe I cooked about 450g of de-seeded pumpkin with skin, wrapped in baking paper then put in the microwave on high for about 12 - 15minutes (time depends on micro power), turning once or twice during cooking to evenly cooked all sides. Leave to cool, remove skin then roughly chopped. (can also used steamed or baked pumpkin). * mandarin or tangerine peel is more fragrance than orange. Cut agar strips into small pieces with scissors, boil with 3 cups of water till agar strips completely dissolve. Add sugar and stir.Then add pumpkin. Stir and check if the mixture needs more sugar. Heat mixture till boiling. While the mixture is cooking, mix cornflour with 1/2 cup water then stir in 1 cup of coconut milk. Pour this into the pumpkin mixture soon as it boils. Stir vigorously to avoid lumps. Heat till mixture thickened and coming to a boil near the rim of the pan. Heat off. Cover and leave mixture to cool for about 15 minutes. Pour mixture into container or jelly moulds. Leave to cool then chill in the fridge. Cut into pieces or turn out from jelly moulds. 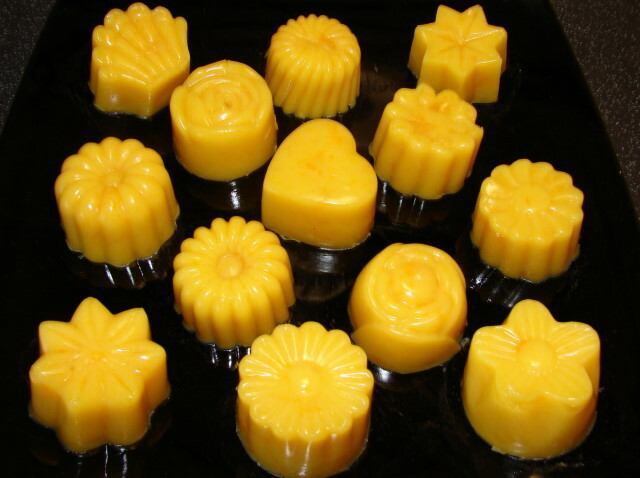 * If using jelly moulds, brush moulds with thin film of cooking oil. These makes the pudding easier to turn out.